A man named Roland (pictured above, right) shared that perspective at a press conference on Wednesday, March 23 at the Millionair Club. Roland is getting that little extra step thanks to a new program called Jobs Connect. The Downtown Seattle Association, United Way of King County, the city of Seattle and the Millionair Club Charity have launched this employment program to connect homeless individuals in Downtown Seattle to unfilled jobs. The Metropolitan Improvement District (MID), managed by the DSA, is the anchor employer for Jobs Connect, offering work with the DSA/MID Clean Team. The clean team patrols the streets of Downtown, picking up trash, removing graffiti and pressure-washing sidewalks, among other tasks. The MID identifies how many workers are needed the following day and fills those jobs with Jobs Connect participants. Utilizing a mobile strategy, Millionair Club Charity outreach workers are circulating through Downtown on foot and in Jobs Connect vans, focused on engaging and enrolling visible individuals. Supportive services and assistance are provided to eliminate the common barriers that prevent many homeless people from working such as transportation, access to certification, storage of personal items and hygiene facilities. The connection is rapid, with an assessment and services being delivered on day one, and on-the-job paid training beginning at $12 per hour on the second day. As the program grows to scale, additional Downtown employers will be identified who employ workers on an ‘as needed basis’ as well as additional employment specialists, outreach workers and Jobs Connect vans. 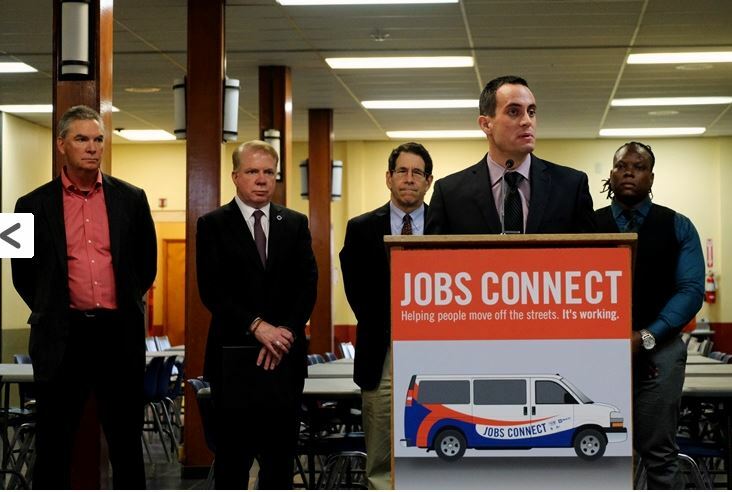 Start-up costs for Jobs Connect have already been raised with an initial investment of $92,000 from the city of Seattle, and an additional $85,800 raised from private philanthropy through United Way of King County. United Way plans to raise an additional $248,300 by July 1, 2016 to significantly expand the program. Expected first year client contact will number 3,000 individuals with a take up rate of 40 percent. To learn more about the Jobs Connect program visit www.uwkc.org/ending-homelessness/jobs-connect.